CMA-CGM's ships carried some 500,000 containers into and out of the U.S. in 2003. NORFOLK, Va.  CMA-CGM, (www.cma-cgm.com) one of the world's largest container-shipping lines, has made Norfolk, Va., (www.norfolkdevelopment.com) its new port of call for the company's North American headquarters. The Virginia city won the 376-employee project over Houston, the only other city that was still afloat in CMA-CGM's short-list competition. The area's status as the East Coast's second-largest port and a container-shipping stronghold was obviously a major dynamic in the decision. But another major factor in landing the project was Norfolk's ability to offer a headquarters site that was conveniently close to area airports, ports and hotels, said John Van De Merwe, president of CMA-CGM America, the French parent firm's U.S. arm. CMA-CGM represents the second major container-shipping firm to relocate its headquarters to Norfolk (pictured) in the last four years. "We are excited about our new headquarters building," Van De Merwe explained. "We believe this investment will help us better serve our customers and grow our company profitably." Part of that growth will come in Norfolk, where CMA-CGM is adding 116 new headquarters jobs, said Van De Merwe. The 230 other headquarters positions, however, already exist - and not far away. Those jobs are presently situated in Virginia Beach, about 19 miles (30 kilometers) east of CMA-CGM America's newly chosen site in Norfolk. The Virginia cities' proximity prompted a slightly sticky situation in the project's early stages. CMA-CGM contacted the Norfolk Economic Development Authority (EDA), saying that it was interested in the city as a possible site for relocating its U.S. headquarters from Virginia Beach. Norfolk EDA Director of Development Roderick Woolard immediately followed up on CMA-CGM's call by again picking up the phone. This time, though, he called his economic development counterparts in Virginia Beach. Virginia Beach officials, Woolard learned, were already working hard to keep CMA-CGM's U.S. base at its current location. That information prompted Norfolk officials to quietly pull back from the project. Norfolk didn't pursue further contact with CMA-CGM, waiting to see how its nearby neighbor's retention drive played out. The Norfolk International Terminals (pictured), part of the area terminals that collectively make up the Port of Virginia, sits only some seven miles (11 kilometers) from CMA-CGM's new headquarters site. Things soon played out disappointingly for Virginia Beach. CMA-CGM officials informed Virginia Beach officials that their city was out of the hunt. The U.S. headquarters for the world's fifth-largest container-shipping firm, they said, was definitely going to relocate, and it was headed to one of two cities: Houston or Norfolk. Norfolk then presented CMA-CGM with potential area sites. One of them - the Lake Wright Executive Center - struck a strong chord. The business park sits adjacent to the Norfolk International Airport and I-64. And the Lake Wright Executive Center is only some seven miles (11 kilometers) from the Norfolk International Terminals, part of the Commonwealth State's peninsula terminals that collectively make up the Port of Virginia. In addition, Lake Wright Executive Center had three hotels inside the park that were already open or were well into construction: Holiday Inn Select, the Norfolk Airport Hilton, and Residence Inn by Marriott. That further boosted the site's appeal. The park's housing options would improve time-efficiencies in shuttling executives in and out of a headquarters locale. CMA-CGM officials didn't publicly mention another aspect of the Norfolk business park that may've also played a role in the location decision: Lake Wright Executive Center was already home to the headquarters operation of another major container-shipping company, Zim-American Israeli Navigation Co. (www.zim.co.il). What's more, Zim-American in 2001 had also relocated its North American headquarters. The company moved its 235-employee continental base to the Norfolk park after spending 25 years on the 16th floor of New York's World Trade Center. Zim-American, which is 48.6 percent owned by the Israeli government, considered 129 North American cities in its relocation decision, company officials said. 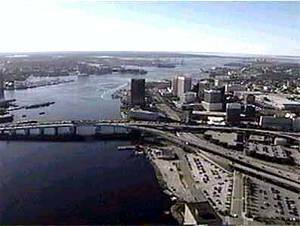 Norfolk in that project was again in direct competition with Houston, as well as another Virginia short-list finalist, Richmond. Zim-American officials cited the area's lower costs as a major site-selection factor. And lower costs have certainly been part of the resulting outcome. The Israeli company has reported US$5 million in savings thus far from the relocation to Norfolk. CMA-CGM will build its new $11.5-million U.S. headquarters on a seven-acre (three-hectare) site in Lake Wright Executive Center, Van De Merwe said. The office park sits on land that was once the site of Met Park, which from 1970 until 1993 was the home field of the Tidewater Tides, Norfolk's Triple-A baseball team. In '93, though, the baseball organization relocated to a newly built home field, Harbor Park, in the process adopting a new team name, the Norfolk Tides. CMA-CGM will build its new headquarters in Lake Wright Executive Center (pictured), the onetime site of the Tidewater Tides' home park. That was when the Norfolk EDA stepped up to the plate. And it hit what's turned out to be a business-recruiting home run. The EDA spearheaded the redevelopment of the onetime baseball site and then began marketing the 70-acre (28-hectare) Lake Wright park. Expansion inside the development has been brisk of late. 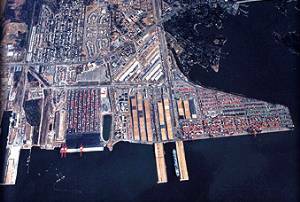 CMA-CGM's new headquarters site, in fact, was the park's last remaining available parcel. The shipping firm's headquarters will be the seventh facility in Lake Wright. The other six buildings that have been completed or are under construction span some 800,000 sq. ft. (72,000 sq. ft.). Occupancy rates are near 90 percent for the space that's currently online, park officials say. Last year, the Lake Wright office park saw more than $40 million in new development, they added. Jobs at CMA-CGM's new Virginia headquarters will pay salaries averaging $40,000 a year, Van De Merwe added. The expanded headquarters in Norfolk reflects the U.S. market's growing importance in recent years for Marseilles, France-based CMA-CGM. Last year, CMA-CGM's fleet of 157 ships carried 2.8 million containers worldwide. Some 500,000 of the containers that the company carried in 2003 went into and out of the U.S. CMA-CGM expects further strong growth in its U.S. container volume this year, Van De Merwe said. 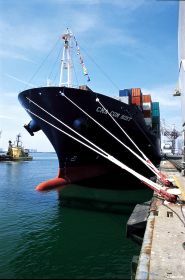 The company also operates an extensive rail, truck and barge inter-modal network in North America, connecting its customers to its shipping services. Worldwide, CMA-CGM employs 5,900 workers. bd0301bbd0301b ©2004 Conway Data, Inc. All rights reserved. Data is from many sources and is not warranted to be accurate or current.